The docks. Ships. Rail and trucks. Images of moving cargo readily come to mind when we think of the working waterfront. The Port of Oakland is a busy, bustling hub of cargo transport conveying, among other things, a steady stream of containerized consumer goods from China to distribution warehouses as far away as Reno. Abundant Central Valley produce takes its turn in shipping containers to be whisked across the Pacific to Japan. Oakland’s port is large by any standard, and on the West Coast, only Los Angeles and Long Beach—the nation’s largest ports—move more goods than Oakland. Five thousand trucks travel highways and city streets to and from the Port of Oakland, and on any given day Oakland’s seaport terminals process 10,000 transactions of truck-driven cargo through their gates. Industry touts the Port of Oakland as the engine that drives a $7 billion goods economy geared to serving up massive amounts of consumer staples to Northern California. But in a literal sense, it’s also the engine that spews soot and diesel pollution over an equally vast part of the state. The adverse health effects of diesel exhaust on neighboring communities are at the heart of the movement to clean up tailpipe emissions of big rigs serving the Port. One study from 2002 found asthma rates among young children to be seven times higher in West Oakland than in other parts of the county. It also identified elevated rates of heart disease, cancer and premature death. A 2008 California Air Resources Board report attributed 70 percent of these elevated health risks directly to diesel trucks. Yet, in 2007, the Port of Oakland released its own “emissions inventory” asserting that 80 percent of diesel particulates, or soot, comes from the large container ships calling at the port’s 20 berths. Big rig trucks, it said, account for a slight six percent of Port emissions. According to Oakland Port Commissioner and community activist Margaret Gordon, these discrepancies highlight the different aims and measuring methodologies of agencies. She contends that investigators would do well to measure diesel pollution levels inside the West Oakland homes where soot collects and people live. That has yet to be done. Last year marked a turning point, as all port trucks in California were required to meet new clean air standards. Due to the proximity of ports to residential neighborhoods, port trucks are subject to stringent anti-pollution measures that were made mandatory years before other classes of trucks. One year after the state’s diesel emissions rule for drayage trucking went into effect the air is cleaner. But by how much? Margaret Gordon, who continues to wipe dark soot off interior fixtures, allows that West Oakland air quality has improved “a little bit.” She’s still looking for long-term beneficial effects in her community, such as a reduction in the incidence of asthma, before making any resounding pronouncements. The Bay Area Air Quality Management District (BAAQMD), the agency that partially funded and administered emissions reduction grants to local truckers, cites an unexpectedly bright statistic from a recent study by the University of California. Upgrading or replacing 3,100 trucks to meet last year’s deadline for emissions compliance successfully eliminated 50 percent of the airborne diesel “black carbon” soot detected near the Port just one year before. “This is exciting news,” said Tina McRee, an environmental planner for BAAQMD. 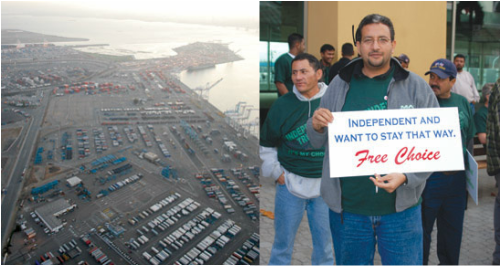 If Oakland truckers can take pride in their actions as socially responsible citizens responding to the needs of a complex port ecosystem, they still fear for the future. Indeed, they feel themselves an endangered species. The next round of state environmental regulations requires that all port trucks greatly reduce the emission of greenhouse gases from their exhaust pipes. Of the 5,800 emissions-compliant trucks currently serving the Port, some 4,400 will need to be replaced with new models by the year 2014. “But who will pay for all this?” asked independent operator Ibrahim. The question lingers in the air.